NOTE: Due to adult themes, language, and alcohol use, One Funny Mother is suitable for mature audiences ages 18 and over. INFO: This outrageous and side-splitting 80 minutes of sass follows One Funny Mother star Dena Blizzard on her hilarious journey through a typical day as a mom as she prepares for her big “Girls Night Out.” Along the way, she laments how her life and marriage have changed since becoming a mother of three, wrestling with the eternal question, “Have I gone crazy since having these kids?” The answer is a hysterical, “laugh ’til your face hurts” comedy that you won’t want to miss! CINCINNATI, OH – One Funny Mother Dena Blizzard, the viral video star and off-Broadway comedy sensation, will bring her hit one-woman show to Cincinnati’s Music Hall Ballroom on Thursday, March 21, 2019 at 1:00 PM & 7:30 PM. Dena’s hilariously relatable collection of stories will make you realize you’re not crazy, but motherhood sure is! The show is part of Cincinnati Arts Association’s 2018-19 Presenting Season. Tickets go on sale Friday, February 8 at 10:00 AM at www.CincinnatiArts.org, (513) 621-ARTS , and the Aronoff Center and Music Hall Ticket Offices. Due to adult themes, language, and alcohol use, One Funny Mother is suitable for mature audiences ages 18 and over. One Funny Mother stars comedian, former Miss New Jersey, and married mother of three, Dena Blizzard, in her hilarious solo comedy show about the trials and tribulations of motherhood and marriage. An outrageous and side-splitting 80 minutes of sass follows Dena on her hilarious journey through a typical day as a mom as she prepares for her big “Girls Night Out.” Along the way, she laments how her life and marriage have changed since becoming a mother of three, wrestling with the eternal question, “Have I gone crazy since having these kids?” The answer is a hysterical, “laugh ’til your face hurts” comedy that you won’t want to miss! Dena Blizzard first gained notoriety as the “Target mom” from her “Back to School Rant” (96 million views) and “Chardonnay Go” (24 million views) viral videos. She is a comedian and mother of three who has starred Off-Broadway in her one-woman show One Funny Mother, created “Chardonnay Go, The Board Game for Wine Lovers, Moms and Other Shameless People” and “Shiraz on the Shelf, a New Christmas Wine Tradition,” and can be found drinking in her living room on her weekly Facebook LIVE show, “Tipsy Tuesday.” A LIVE with Kelly Top 5 Co-Host Winner, she has served as the official host of the Miss America Pageant Preliminaries for ten years, has co-hosted with Anderson Cooper, was a warm-up comic for four years, and had her own talk show on NJ 101.5 FM. She can be found on Facebook, YouTube, Twitter, and Instagram @OneFunnyMother and online at OneFunnyMother.com. Before hitting the road for a national tour, One Funny Mother was named “Best One Woman Show” at the 2015 United Solo Festival in New York City. 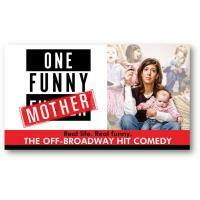 One Funny Mother is a great “Girls Night Out” or date night for anyone that IS a mom, HAS a mom, or is MARRIED to a mom.